Join PSNI | How Do I Join? The recruitment process is made up of 8 different stages, all of which you must pass to be invited to your Induction Day at the Police Training College. Following this, you will then start your exciting journey of becoming a police constable! Take a look at the short video and click into the different pods to get more information on each of the stages of the recruitment process. Before you apply, ask yourself... Can you commit? When completing your online application you will be given the opportunity to declare any reasonable adjustment needs, which you may have, which would allow you to participate fully in the recruitment process (including the Initial Selection Test and the Assessment Centre). Please refer here for full details on the process to follow to request and evidence any reasonable adjustment needs. Age: Applicants must have attained the age of 18 years and be no more than 57 years on 19th April 2019. Nationality: Applicants must be eligible to work permanently in the UK. Education: Applicants must have a minimum of 5 GCSEs (or equivalent) at A*–C grade, including Maths & English Language. Below is a screenshot from the Application Form. With your application form now successfully submitted, the next stage in the process is to complete the online Initial Selection Test (IST). You will receive a unique individual link for you to access the test to the email address you provide in your application form. You will receive this link by the week commencing 1st November 2018. The IST is made up of two assessments designed by Deloitte for this recruitment process; a situational judgement test and a verbal reasoning assessment. You have only ONE OPPORTUNITY to complete the test so we would advise you to wait until you are fully prepared before starting your IST. You should also be aware that the IST will be re-tested at Assessment Centre. For access to a detailed briefing on the IST please click here. To have a go at some practice questions then please click here. 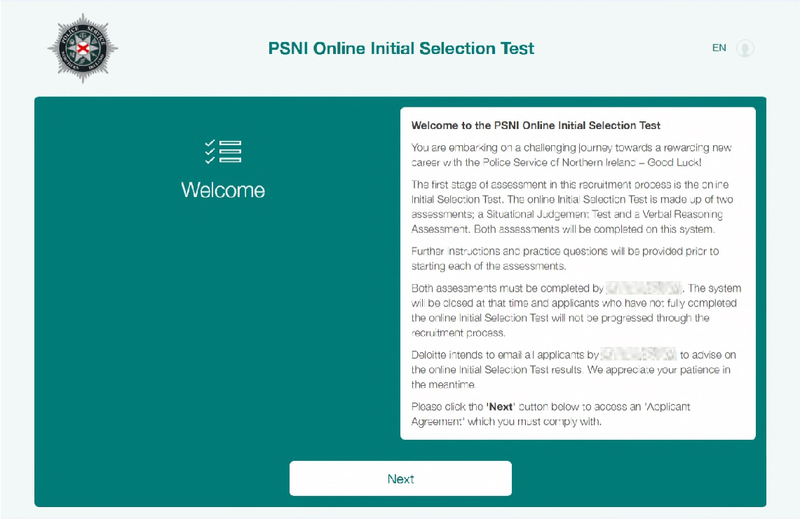 Below is a screenshot from the Online Initial Selection Test. Please refer to the Guidance for Applicants (1MB) for more information on the personal behaviours. The Assessment Centres run Monday - Friday and are held in locations in and around Belfast. If you are invited to attend an Assessment Centre you will be required to provide evidence of your education qualifications. If you have lost your certificates, please apply for new copies now so that you have these available in time for Assessment Centre stage. For more information on how to prepare for the assessment centre and assessment centre scheduling then please click here. You are required to be vetted as part of the recruitment process. All applicants are required to have a three year checkable history, and if you have spent time in the last three years outside the UK or Republic of Ireland you should be aware that you may be required to provide a copy of any criminal record you have received in another country. Vetting is a complex process and involves various checks to be completed. This includes everyone declared on your vetting applications as well as your wider extended family and other close associates. All applications are considered on their own individual merits. Dependent on your personal circumstances your vetting may take longer than others. If the PSNI can’t carry out necessary checks your application will not be processed further! Detailed information regarding Vetting (including examples of the certain types of offences that mean you will not be considered for appointment e.g. motoring offences, drugs offences, cautions, and financial) can be found in the Guidance for Applicants (1MB). For FAQs regarding vetting, click here. …in other words, the fitness test! The PCA is made up of a number of different activities such as running, crawling, climbing, balancing, lifting, carrying, dragging and weaving. 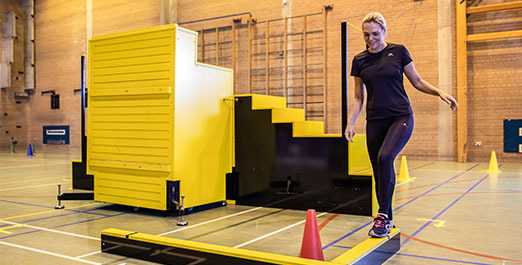 These activities are incorporated into a circuit or obstacle course which needs to be completed three times in 3 minutes and 54 seconds! If you fail the PCA you will be invited to complete one re-test twelve weeks after your initial PCA. You will also be given the opportunity to attend five PCA Support Sessions prior to completing your PCA re-test. Want to see how the course is laid out to help you prepare? Click here for a diagram of the obstacle course. We would advise you to think about starting to prepare for the fitness test now! This part of the recruitment process might seem like a long way off, but starting training now will set you in a better position to tackle the course on the day. If you would like some help with training, click here for an example training schedule. You can also watch the following video to see the PCA in action. For more information on the PCA please refer to the Guidance for Applicants booklet. It is expected that candidates will have already been living a healthy lifestyle in terms of diet and exercise before the medical assessment. If you are invited to attend a medical you will be examined by fully qualified Doctors and Nurses to ensure that you are able to enter into training and carry out your role as a police officer. You can help the medical advisers by providing them with all information and documentation relevant to any current or previous medical condition. You will be required to meet some key medical standards as part of your application to be a police officer. Click on the tabs below for more information. If you have a hearing loss of more than a total of 84 dB over 0.5, 1 and 2 kHz range, or more than a total of 123 dB over the 3, 4 and 6 kHz range in both ears, you are unlikely to meet the standard. When one ear is affected or when aids may overcome the difficulty, further assessment by PSNI’s medical team will be required to identify possible adjustments. If you have a disability you will be considered individually on your merit. The PSNI Medical team will consult with you and consideration will be given to whether there are reasonable adjustments that can be made to enable you to do the job now and for a reasonable time. 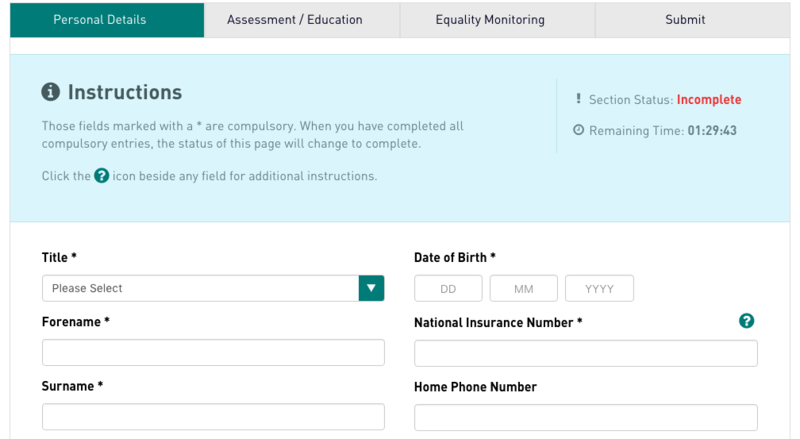 You will have the option to seek an adjustment in the recruitment process when completing the application form. Please note that the Medical Assessment and Substance Misuse Test are assessed independently, and you must pass both assessments in order to progress! Before you start your training you will be invited to an Induction Day at the Northern Ireland Police College, Garnerville where you will meet with your training team as well as representatives from the university who accredit the training who will explain course requirements and support services. You will receive a tour of the Police College and will be measured for your uniform and other items of police equipment. Information will be provided on a number of topics relevant to your future career as a police officer including Occupational Health and Wellbeing, Personal Security and Human Resources. Importantly, you will be introduced to the standards and ethics which apply to everyone in the PSNI. There will be an opportunity for you to ask any last minute questions you may have. Training takes place at the Northern Ireland Police College, Garnerville over a 23 week period. The Programme is university accredited and results in the award of an Advanced Diploma in Policing. After Induction you will be required to undertake and successfully complete the Pre Entry Knowledge Course. This material takes approximately 20 hours, is completed online, and must be fully completed in order to commence the Student Officer Training Programme. You will be given access to this information at your Induction Day. This will provide you with information and context to support your development as a student officer within the Police College.